Hey Andre. Thanks for taking the time out to talk to me about your new film, ‘Leave It On The Floor’. ‘Leave It On The Floor’ starts with our hero, Brad, being bullied by his dysfunctional mom; he flees his home and meets, Carter my character. They have a short-lived exchange and then he follows me down the rabbit-hole into the LA ball scene where he finds a ragtag group of individuals walking the runway competing to win title and bowling trophies. Little does Brad know, but this ragtag group will eventually become his family. They teach him everything he needs to know about the ball scene and the category he will compete in. They also teach him about living the life of a throw away. This movie is filled with quick one-liners, unique songs that you will be singing all night long, and so much love. My character Carter is Brad’s love interest and leads him into the LA ball world. Carter was thrown in a dumpster when he was born and has literally raised himself. He’s very wise beyond his years as he’s seen and lived through so much. What makes him different is he wants to get to know Brad slowly instead of jumping straight into bed with him. I recently moved to LA, and my agent sent me an email for an audition for a new indie film titled ‘Leave It On the Floor’. I looked over the sides and instantly felt connected to the material. I went in for the audition where I had to read through a couple of scenes, dance and sing. Following that I had a couple of callbacks a week later and two weeks after I found our that I booked the role. 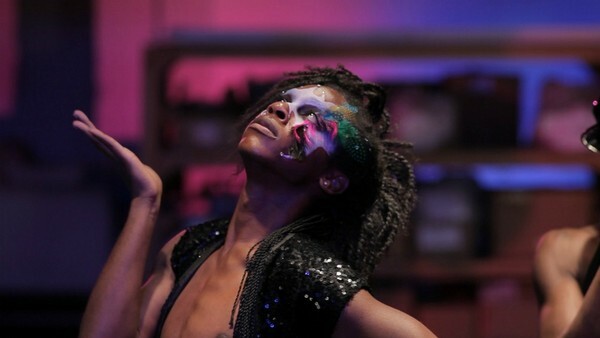 This movie, just like its predecessor ‘Paris Is Burning’, opens the doors to an underground world that few know about. But unlike ‘Paris Is Burning’, ‘Leave It On The Floor’ shows you this world through many songs and dance numbers that further the story. Also with it being a “gay film”, this movie is working its way to becoming a cult-classic film and has the potential to be a cross over film. This movie shows what family is, which is not just a mother and a father. It also shows that no matter what we’ve been through we all just want to be loved in the end. The film stars Ephraim Sykes, your good self, Phillip Evelyn, Barbie-Q, Cameron Koa, James Alsop, Metra Dee, Demarkes Dogan and Hailie Weaver – with Sheldon Larry onboard as director – what was it like working with the cast and crew on-set? Any good anecdotes? The cast was very talented, so fun to work with and we really became a small family for two months. There were many overnight shoots where we’d start at 10pm and wouldn’t finish shooting until 10 am and that really brought all of us closer together, we were all on set striving for the same goal: to tell this story! Let’s talk a bit about you Andre. What made you want to get into the industry in the first place? I’ve always enjoyed acting, singing and dancing as a kid, and I trained in each focus separately. When I started training at Duke Ellington School of the Arts, that’s when I decided to dedicate my life to being an artist. I find so much joy in acting, singing and dancing; it’s also very therapeutic. Every time I take on a new character I get a chance to step outside of myself and step into their life and world. Whenever someone tells me that they’d like to get into the entertainment industry, I tell them: be dedicated, focused and love every moment of what you’re doing. Always train / and work on your craft, you will always learn and grow. Be confident, and be honest with yourself. Know your strengths and weaknesses, so you know where you are and where you need to go. Always approach your with from a truthful place. Stay humble and polite, people want to work with nice and talented people. Last year I did a film with Margaret Cho where we had a couple of scenes together. She was the quietest and most polite celebrity to work with. When she wasn’t filming she would watch some of the other scenes going on and smile. When she was in the scene she’d totally morph into this hilarious, bold and loud character so far from who I met when the camera was off. I loved watching her transformation. I’m currently listening to Jessie-J, David Guetta mixes with everyone, Prince, Michael Jackson, Stevie Wonder, John Legend, and Amy Winehouse. I would have dinner with Meryl Streep, Viola Davis, Angela Basset and Terrance Howard, as I respect them all as fellow actors. I know that’s four BUT I couldn’t choose! If I was on a desert island and could only bring three personal things, I would bring all my photos of family and friends, my I-Pod full of music for entertainment, and deodorant for the underarms to keep them fresh….. So much is happening this year. I have a men’s clothing and underwear line – Nine Menswear and Nine Below – which can be viewed and purchased online at http://www.ninemenswear.co. Recently we had some pieces from the line pulled and shot for GQ (Mexico). We will be showing the line during LA Fashion Week October 11th at The Exchange in down town LA. I’m completing a solo pop album, that I also wrote most of the songs. I’m looking to release singles later this year, and hopefully touring. Earlier this year I filmed national commercials from AARP Insurance and Skype. I’ve been on contract since April doing ‘Hairspray’ and ‘Aladdin’ – both musicals. I look forward to returning full-time to LA in early November to start taking on new projects. You can always keep up with my acting projects by visiting – http://www.andredarnellmyers.com. Previous Eva Link – (House At The End Of The Street – 2012). Next Jesse Lawrence – (The Knot – 2012).